The former Kyoto University Southeast Asia Forum (FY2007-FY2015), now known as the Kyoto University Southeast Asia Network Forum (FY2015 to present) is an international forum. It promotes research results conducted by and with Kyoto Universities scholars to the general public in Southeast Asia based on collaborations between Kyoto University and alumni and alumna associations of Kyoto University in each country in Southeast Asia. The forums have been held twenty-four times in different Southeast Asian countries (see list below) since the first forum was conducted in Jakarta, Indonesia in November 2007. CSEAS has has been pivotal in facilitating the forums. Since its establishment, Kyoto University has accepted a number of Southeast Asian students as foreign students or scholars. Most of them are active as public intellectuals in various fields such as education institutions, the government sector, and private business upon return to their home countries. Kyoto University has started to establish alumni and alumna associations in Southeast Asian countries and the forums have become great opportunities to rekindle the network among alumni and alumnae and also between them and Kyoto University to socialize and spread research results to Southeast Asian societies. 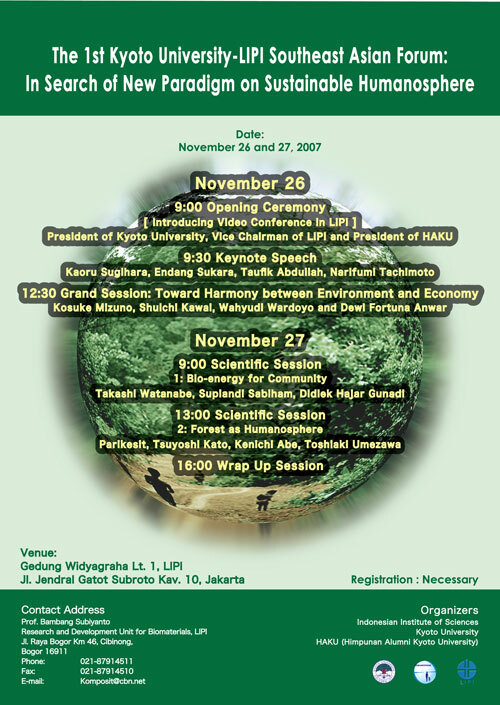 8th Kyoto University Southeast Asia Forum 2011： What to do and not to do during an earthquake?